myoldmac.net - Vintage & Classic Apple II gs Collectibles - Buy it now! In Sep. 1986 Apple Computer introduces the Apple IIgs, with the Apple 3.5 drive, for $1000 US. The last member of the Apple II line, The Apple IIgs was also the most powerful. It included expanded graphics and sound functions, and was initially offered with 256k of RAM, expandable to 8 MB. The IIgs also offered 128k of ROM, expandable to 1 MB. 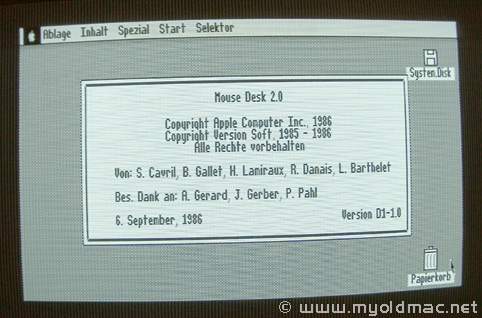 The IIgs shipped with a Mac-like interface and introduced the Apple Desktop Bus (ADB) port. (It also ran most other Apple II software.). In Sep. 1988 Apple Computer releases GS/OS, a 16-bit operating system for the Apple IIgs. The IIgs was later offered with 1 MB of RAM, and 256k of ROM. It could also hold a SCSI adapter card. In Dec. 1992 Apple Computer discontinues the Apple IIgs. Steve Wozniak was quite involved in designing the general layout of the IIGS. Insisting on keeping it simple, he recommended against a built-in co-processor (as they tried to do with the IIx). He also wanted to keep the 8-bit part of the machine separate from the 16-bit part. To accomplish this, he and the other engineers decided to design it so the memory in the lower 128K of the machine was "slow RAM", which made it possible for it to function just as it did on the older Apple II's. This included the memory allocation for the odd addressing schemes used in the text and graphics modes and (which made sense in 1976, but not in 1986). The rest of the available memory space would be fast, and could be expanded to as much as 16 megabytes. With a faster microprocessor, it would also be possible to run programs more quickly than on the older Apple II's. Info Source: Duprau, Jeanne, and Tyson, Molly. "The Making Of The Apple IIGS", A+ Magazine, Nov 1986: 57-74. 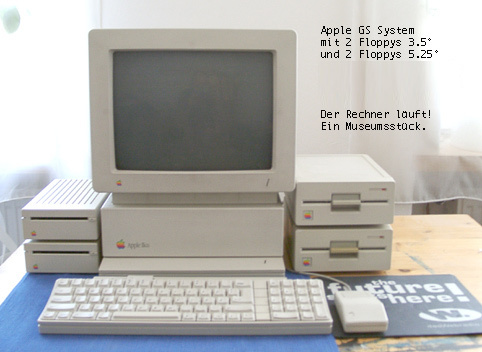 Sales were strong initially and the IIGS even outsold the black and white Macintosh units that were its contemporary. Sadly, Apple wanted Macintosh to be its future. The total number of advertisements and commercials for the IIGS could probably be counted on one hand. If the computer had been introduced a year or two earlier, things might have been different. The last member of the Apple II line, was the most powerful Apple. The IIgs was built around a Western Design Center 65C816 processor running at either 2.8 or 1 Mhz. It included expanded graphics and sound functions, and was initially offered with 256k of RAM, expandable to 8 MB. The IIgs also offered 128k of ROM, expandable to 1 MB. The IIgs shipped with a Mac-like interface and a IIgs-specific OS, and introduced the Apple Desktop Bus (ADB) port. (It also ran most other Apple II software.) The IIgs was later offered with 1 MB of RAM, and 256k of ROM. It could also hold a SCSI adapter card. It was discontinued in December of 1992. The Ensoniq chip in the Apple IIGS was a brilliant move by Apple, but it drew a lawsuit from Apple Records, the Beatles' record label. Apple never again put a synthesizer chip in any computer. Even today, the Macintosh does not have hardware synthesizers. The Macintosh works around this by using software-based synthesis. Apple II GS Easter Egg: The IIGS with ROM version 3 has an audio recording built-in. Upon booting, when you see the "Open Apple" move back and forth on the screen, press <Control> <Open Apple> <Option> <N>. You will hear the IIGS design team shouting "Apple 2". Apple Museum has an actual sound sample on their Apple ][ GS page that you can listen to. On older sytems with ROM version 1, you will see developers credits.